You are a creative person! 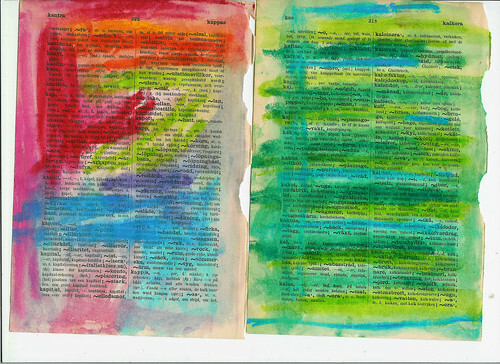 You are that blank page to fill with text and then paint in rainbow colors! I had the presentation for my design project today and I feel I did such a bad job :[ Everyone else’s was so much more creative and nicer than mine. Sometimes I don’t think of myself as creative at all and I get frustrated. I think I am somewhat creative at times, but then I see what other people do and I’m just like, wow, I am so lame! Ha, but anyway, I got kind of side-tracked there! Even though her main question was not really about feeling small it struck me as the most important part in her letter. It affects all of us, daily. So that’s what I wanted to write about in my response to her as I felt we could all need encouragement and support here! And because I know many of you struggle with this, just like me, I’m posting my answer here. Read my answer to her and then feel free to add your own suggestions and opinions in the comment section! it is very easy to get overwhelmed with how good “everybody else” is, isn’t it? Especially when we sit and browse many blogs at a time… It seems like everyone else is doing so much and everything is looking so darn good… It kind of melts together into a pot of Other Peoples Creativity and when you look at your own creation it is so small and insignificant. Of course you have the wrong glasses on! I think you have to always remember that what you see is not made during one day or even a week. It might look like it’s whipped together with ease but most crafts take time, practice and effort. Others might have an art education or work as full time artists and you might not! Many of us post what we are happy and proud about and not our ugliest creations! This might seem like a lie but I don’t think it is, as long as we all remember that a blog is not a true image of our life! This is only that tiny fraction of what I am that I want to share with you today! Part of why I blog is because I need to tell myself that I do create all the time! I think many people see me as inspiration and you might view me as someone who is very productive – but on low energy days I often feel that I have done nothing and can’t do anything. Or at least not as much as everyone else do or are, hehe! I think it is important to remember that you work from your own circumstances! Compare your work today with what you did last year or three years ago and hopefully you’ll see that you’re improving! If not then take a class and keep letting yourself experiment and develop! If you don’t have or want to have a blog I think a diary is a must have for anyone creative! Start writing today! I hope that you will remember after this bad day is over that you ARE a creative person and that you can do anything (yes anything!) just not everything (what a sad thought for all of us over archivers!) and not at once (because time is limited no matter what people say to you)! I do love when new to me people find my blog and find inspiration! That’s another big reason for me to blog about creativity. Thanks for writing to me. I will blog about this as I think it’s an important topic! Take care and enjoy what you do have time to create! I always appreciate when people write but I sometimes don’t have the time to answer this thoroughly which is sad. Unanswered feedback and questions always makes me feel like a bad person! I think the best part of blogging is getting comments – but it is also difficult to know who to answer, how and in what time? Recently I’ve gotten questions about what to see and do when you’re in Stockholm. I think I got two new questions about it this week and before I knew it I’d started A Guide to Stockholm with iHanna’s personal favorites! It took me over three hours to compile links and thoughts together, and I don’t know if I’m finished yet… I’ll post it next week and after that I’ll just send on the link if I get questions about it again! Time is precious and I am so darn good at wasting it. That is, it’s not a waste of time to be nice and answer comments and e-mails, but it sure feels like a waste of time when I go back to my list of Things To Do in the evening and I can’t cross anything over today either. This is why I’m thinking of a blog time out for real now. It might be productive to blog but it’s not moving me in the direction I want to go!!! This entry was posted in A Creative Life, On writing, Other's Creativity. Bookmark the permalink. Wow, imagine my surprise when I checked your site this morning! I’m glad that you posted this though. Hopefully it will cheer up and help other people in similar situations. And I got a new assignment for that class… I have to design a whole loft now instead of just one room! I’m somewhat overwhelmed, but I’m listening to the advice that you gave me and I’m looking at your site for inspiration! What a sweet response! I’ve written about the small-fish-big-internet issue before in my blog, long ago ( http://corvustristis.livejournal.com/17382.html ), and I’m sure it’ll come up again. thank you so much for that post!! I find myself getting discouraged much of the time because I am not as good as this person, or I don’t know how to do what that person has done-but I try to remember that I AM creating every day now, after 22 years of not picking up that pencil to draw because it was too late to start now – that I am better today then I was last month, and next month I will be better than I am today (as long as I continue to create)……maybe I will never be as good as some of my favorite bloggers, but I will be as good as I can be, I will do my best, and I will continue to grow! I hope you have a great day, and thank you for your wonderful blog!! Sound advice. Beautiful response to her comment. I know exactly what you mean about the “not crossing things off my to-do list” at the end of the day. I get like that too. Remember to give yourself permission to be imperfect. That’s one advice I like to give myself once in a while. Great post! It is also hard when the people around you are not creative and just ‘don’t get it’ when you have finished working on something, that’s why I love reading blogs, so many different ideas and talented people out there. About posting comments, I actually took action on this and posted a pledge this week to become a better commentor, I am aiming for a few a day…. Your response to this comment was wonderful. I have seen so many people both young and old get discouraged for whatever reason – and your response to this comment was so encouraging and kind. I enjoy your blog and it if full of inspiration – but your thoughtfulness is even more inspiring. Hanna, I have felt so stressed for time, and so unproductive, so I hear you about those issues. I have taken breaks from the blog and they are worthwhile, but I also feel that visiting others and also blogging helps to fuel me, too. So it’s just a balance, like everything I guess. Your letter to Allison was so right-on! A single image does not tell the whole story of its process! And we creative people (I mean, we who acknowledge that we are creative) are often not meeting our goals. It’s frustrating! But one other thing that I remind myself a lot, and it’s a personal issue for me, but it might help Allison, too. Quite often we mysticize the work of other people. We look at it as perfect or not achievable because we ourselves did not think of it or go that way. And we look at those works with only partial understanding because, of course, they didn’t come from us. So when we (I) find myself doing this, I try to humanize the art piece, and remind myself that just because it didn’t come from me or look like my style of working, that doesn’t mean it is not just as imperfect or subject to human limitations as mine is. And that’s what makes our work so great and always unique! At every turn, something an artist does could have come out looking like something else! It could have been a very different thing! But it’s not a mystery! It’s a process. The process of self-expression. Anyway, I try not to mysticize the work of people I admire quite as much as I used to. I can still admire and aspire to their achievements, while also being proud of my own. Sometimes young people don’t meet up against this realization, but I’ve had to meet it time and again! Jag har smyglast pa din blogg i nagra manader nu och uppskattar en liten injektion av farger varje dag i blogglasaren. Tankte bara rekomendera en bok av Emma Pihl som heter “vinnare i din egen tavling” fran betydelsefullas forlag, hon skriver mycket om att jamfora sig sjalv med andra och liknande teman. jattebra lasning, och mycket peppovningar for att inte dras ner i negativa tankar! A lovely response letter to Allison. I feel it does remind all of us that we are creative. We shouldn’t compare our creative outpouring to others. What we create is so individual to who we are right now and where we have come from. I understand the need to take a blog time out. Keeping a blog takes a lot of energy and creativity. Sometimes you need to put the creativity on other things. If you take a time out, we’ll all be here when you return. thank you for sharing this. You are so talented with words. Your blog and creations are certainly an inspiration to me. Enjoy your Friday! Great inspiration, Hanna! I’ve only been working on mixed media art for a year now and I know how hard it is to not compare what I do to all the beautiful work I see. Fortunately I just love the process of creating and people are so kind and encouraging. Thank you for all you share on your blog.